Police in New Jersey have officially crossed the [thin blue] line and literally attempted to confiscate guns from an army veteran without a warrant. But it didn’t go as planned, because Leonard Cottrell Jr. refused to comply with the orders of the cops. Eventually, all gun confiscation will be carried out by the police; who of “don’t make the laws, they just enforce them,” and Cottrell found this out the hard way. After serving two tours in Operation Iraqi Freedom overseas, Cottrell found himself at end of the state’s tyrannical oppression and gun elimination scheme. According to The Daily Wire, two police officers were given orders to go to Cottrell’s home to confiscate his guns. The order followers complied, and “because [Cottrell’s] 13-year-old son had made a comment at school about the Millstone Middle School’s security, and the officers wanted to confiscate Cottrell’s firearms as part of an investigation,” NJ.com reported. But Cottrell disobeyed and defied the orders of the police. “No one from the state was going to take my firearms without due process,” Cottrell said,according to NJ.com. 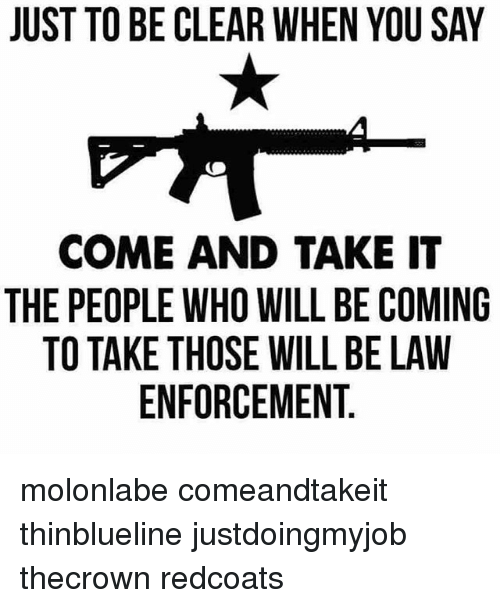 According to New Jersey law, signed into lawCottrell’s disobedience is “illegal.” Democrat Governor Phil Murphy a bill that makes it incredibly easy for law enforcement to confiscate firearms without due process and for seemingly any reason the state deems. The reasons for protesting Urban Shield are clear. It is one of the ways that local law enforcement gets access to, and romanced by, military and surveillance technologies like the ones we’ve seen turned against protesters in Ferguson, as well as low-level crimes, across the country. Urban Shield is coordinated by the for-profit company Cytel Group, and in addition to training exercises, it also functions as a marketplace and testing site for new militarized technologies. The accompanying trade show includes exhibitors from armored vehicle manufacturers to a “counter-terrorism magazine.” In 2013, companies were encouraged “to place their products and technology directly into the hands of SWAT, Fire, EOD, and EMS professionals.” Vending at Urban Shield is touted as a way to get “invaluable real-time feedback for vendor product[s]” since “at the end of every scenario the teams are questioned concerning the benefits and drawbacks of each piece of technology used in that scenario.” It’s unsurprising that Urban Shield has a “try it out” component for law enforcement, since there is an incredible amount of profit to be made from such products, often with federal funds i.e. taxpayer dollars footing the bill. Much of the criticism around UASI is that the grants enable purchases of equipment that no community should adopt without a public conversation. The obvious examples are armored vehicles and so-called “less-lethal” weapons like tear gas and rubber bullets, like those used to violently suppress demonstrators in Ferguson. But UASI funds can also be used to purchase sophisticated surveillance equipment that, absent safeguards, could allow local law enforcement to spy on activists before demonstrations ever take place, or to racially profile people of color in communities like Oakland. Senator Tom Coburn’s 2012 report “Safety at Any Price” lists some of the equipment that has been purchased with UASI money, and it reads like a laundry list of privacy advocates’ concerns: surveillance cameras, mobile fingerprinting devices, automated license plate readers, armored vehicles, and drones. To make matters worse, as Senator Coburn’s report points out, there is no evidence that these purchases make anyone safer. via Militarization, Surveillance, and Profit: How Grassroots Groups are Fighting Urban Shield | Electronic Frontier Foundation.